So often we have patients who come into clinic looking to be rehabilitated back to their sporting greatness only to discharge themselves from care when the pain reduces to a comfortable level or they are able to perform the basics requirements at training. Many times this results in re-injury, secondary injury or lesser performance as the athlete struggles to completely reach the level of play they were at before the injury took place. The calf complex consists of the soft tissues associated with the soleus and gastrocnemius. Both muscles work across the ankle joint with their mutual insertion being at the posterior aspect of the calcaneus through the intertwining of their tendons to form the achilles tendon. These muscles perform both plantarflexion and eccentric control during dorsiflexion of the ankle joint and are vital for force attenuation (reduction) and production of during running. The gastrocnemius has two heads that originate at the lateral and medial condyles of the femur. It is a powerful muscle containing primarily fast twitch muscle fibres, enabling it to create greater force for propulsion during running and walking. The Soleus is a muscle responsible for plantarflexion of the ankle joint, however, more recently the role of the soleus has been further explored and it has been identified as a muscle responsible for the reduction of force during activity by performing an eccentric contraction, opposing the dorsiflexion moment during running. The Soleus has 3 intramuscular tendons, also known as intramuscular aponeurosis) in its architecture. Injury to the intramuscular tendon can increase rehabilitation time and end in recurrence of injury if not identified by MRI in the early stages of the rehab process. One significant reason for completing full rehabilitation of the calf complex is not only to minimise the risk of recurrent injury but to limit the risk of concurrent injury as the presence of one lower limb injury can increase your likelihood of sustaining another injury by 3-7 times. That now being understood what are the goals when it comes to rehabilitation of the calf complex? The first step is gathering as much information as you can from the athlete and the coaching staff about the injury taking place. The second is figuring out exactly which tissues have been affected and the physiological time frames around their ability to heal after a state of trauma. The third step is sitting down with the player, the coach and the allied health group to put a time return to performance time frame in place to which rehabilitation periodisation can be attributed too. Developing clear guideline around the tissue, which has been damaged, and the physiological timeline of which that tissue needs to heal. This may be anywhere from 1 – 85+ days dependant on the severity of the injury and the tissues involved. Furthermore, it should be stressed that this is just for physiological repair of the tissues not inclusive of return to performance. Developing realistic goals with the required rehabilitation participants including; the player, the coaching staff, strength and conditioning team and the medical staff. Taking all the previous information into consideration helps to realise the time frame required for return to play. Return to performance may be reached at the same time, however, variables such as minutes played; game readiness and mental preparation play a significant part. Each person within the athlete’s support community will have their own specific goals or wish list of what the want to achieve in the athletes rehabilitation process – however everyone’s joint goal is getting the athlete back to a pre-injury state. For the medical/allied health team it is primarily about regaining body function, comfort and basic strength as well as putting in place extrinsic interventions for the prevention of future injury. For the strength and conditioning team it is about building and preparing the athlete for the worst possible scenario affiliated with the chosen sport. For the coach it may be ensuring the athlete is prepared for a specific game or event that has been scheduled. For the athlete it may be about returning to full performance as fast as possible. Once all has been established it is time to work backwards! When is our planned return to play date and how long do we have to work toward the end goal of being prepared for the worst-case scenario? What is the requirement of not only the injured tissue but also the surrounding tissues which all work in conjunction to achieve high performance? Knowing the requirements how then do we train them to get to the state of event readiness? Neuromuscular Control: Neuromuscular control is defined as the unconscious trained response of a muscle to a signal regarding dynamic joint stability. Strength: The ability of a muscle to produce maximum amount of force. Speed: The rate of which an object or athlete moves. Power: Is the ability to produce maximum force at a fast rate. Agility: The ability to change the body’s direction efficiently. Endurance: Ability of a muscle to produce force continually over a period of time. Knowing these components and how they interact and relate to the athlete’s performance on field is important when structuring them into a rehabilitation program. In many cases one component may progress while others progress then regress as the athlete continues their rehabilitation. 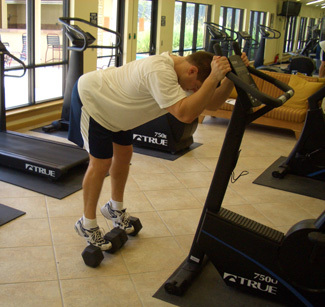 It is important to be aggressive with rehabilitation programs especially while being performed in a controlled environment such as the gym or indoor training centre so the athlete is prepared for the inclusion of more environmental variables to their program as early as possible in their rehab process. The structure of a rehabilitation program can be just as important as the exercises prescribed and how they are coached. Taking advantage of physiological and physical adaptions to training principles can be the small difference in returning a client back to performance weeks or days earlier than expected. Ensuring that activities that benefit from significant neurological input are not performed under fatigue is vital for the development of movement patterns and habitual actions when under fatigued in game day situation. Tendon rehabilitation specialist and researcher Jill Cook recently tweeted an image demonstrating the steps of rehabilitation before return to play. same time with individual goals being set for each – the end goal being return to play. When developing a short time periodised rehabilitation program, the easiest place to begin is at the end. What activity/exercise do you expect the athlete to be able to complete before their return to training where variables are more in number and less controlled? What progressions do they need to complete to get to that point? And at what point do you introduce running to their program? An example of what this may look like is below. We will go into more depth related to return to running soon.